The CHEAP and EASY way to add backboards to your backyard ice skating rink! So you want to add backboards to your skating rink. Backboards are a great upgrade that is well worth the effort but you have to build them strong to support the high leverage loads of impact. There are many expensive and extravagant ways to do this but I am going to focus on how to do this inexpensively, with minimal labor, and minimal materials. First, let’s assume you have a 2’ by lumber skating rink frame. Step 1-Build your rink frame just as you always have. No extra money required and no extra effort. Step 2-Go to the local building supply store and ask for 4’ by 8’ by ¾” plywood ripped to 2’ by 8’ strips. Buy enough plywood to cover your entire back wall. You will now have 2’ by 8’ by ¾” plywood boards ready to add on to the skating rink for backboards. Step 3-Take your first board and lag bolt it to the existing frame about 2” below the top of the frame (see diagrams below). Step 4-After all of the plywood is lagged to the skating rink frame. Utilize the Iron Sleek Outriggers, Iron Sleek Ground Stakes and a support 2 by 4 to give it the needed strength to withstand big slap shots and impact. 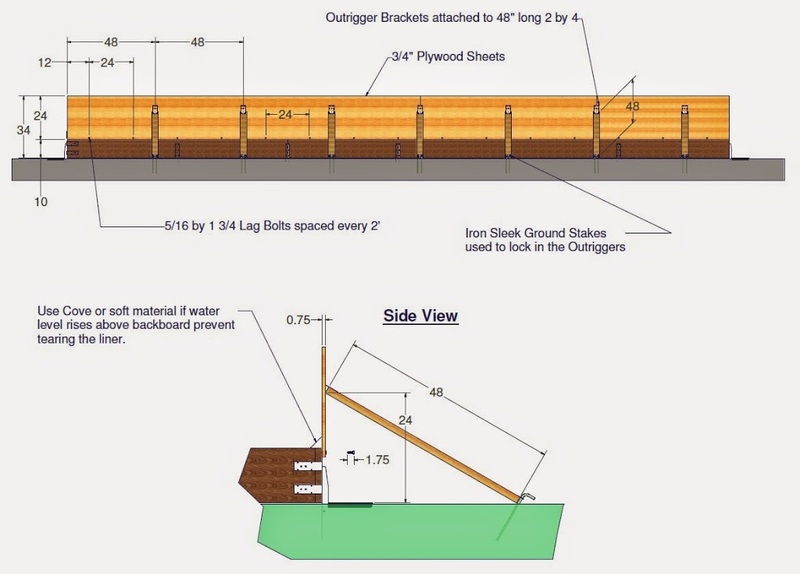 (See diagrams below) If you use our Outrigger kit and Ground Stakes, Iron Sleek will provide you the lag bolts required to put up your backboard upgrades at no cost…FREE LAG BOLTS!! For those who want full sheet backboards, use the same principals explained and diagramed in this blog but increase the size of the 2 by 4’s to 72”. Author adminPosted on September 4, 2014 January 23, 2018 Categories Uncategorized1 Comment on The CHEAP and EASY way to add backboards to your backyard ice skating rink! Backyard Rink, Time to tear it down for Spring! Pavlos Lombardi on The CHEAP and EASY way to add backboards to your backyard ice skating rink! Kristen Dockery on What should I use as RINK BOARDS for my Backyard Skating Rink? ?